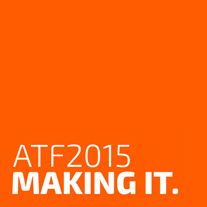 ATF 2015: MAKING IT - WE MADE IT! This site summarises the original 2015 Australian Theatre Forum website and is included here for archival purposes. ATF2015 Making It was the fourth Australian Theatre Forum, a biennial event produced by Theatre Network (Vic), which brings together professional artists, presenters, producers, managers and policy-makers from around the country, and generates discussion around contemporary practice, policy, sustainability and audiences. In Sydney, nearly 400 delegates and speakers came through the event over 3 and a half days, and the feedback is incredibly positive. The event had a great impact in strengthening the sector, increasing dialogue, and allowing us to think more clearly about the future and our place in the world. Our Keynote Speaker, Rhonda Roberts, wrote this testimonial to express her gratitude and the impact she felt the the forum had on our sector. ATF Testimonial and thank you. “Congratulations to David Williams and the ATF team for allowing an important platform that enabled a diverse Indigenous creative voice. Many encouraging, thoughtful, and passionate opinions were provoked, digested and fostered in an inclusive and safe environment, it was indeed a triumph at this year’s ATF. Most importantly, acknowledging the stories, emotion, the baggage and hunger, then to challenge the nature and perspectives of what First nations Theatre was, is and could be from a broad Aboriginal Perspective was a true freedom for us all. Please read through the Documentation page, for the extensive videos, audio, transcripts, photos and media coverage from the forum.